Avoid Serious Damage, Repair Rock Chips! Chipped and cracked windshields are an annoying inevitability of driving. Even if we are as careful as possible, it is very likely that you will encounter minor windshield damage. Many people put off getting small chips and cracks repaired, thinking that it doesn’t matter if they get the damage repaired today, next week, or next month. However, even for the smallest chips, it is important to get the damage repaired as soon as possible. Big chips and cracks are obvious impairments to visibility, but even a small chip can cause a distraction at the wrong moment. After the windshield is compromised, there is a significant chance of the damage expanding – turning a small chip into a big problem. Significant temperature fluctuations, such as taking your vehicle from the hot sun to a cool garage, increase the risk of making the damage worse. Automotive glass is manufactured under high tension. 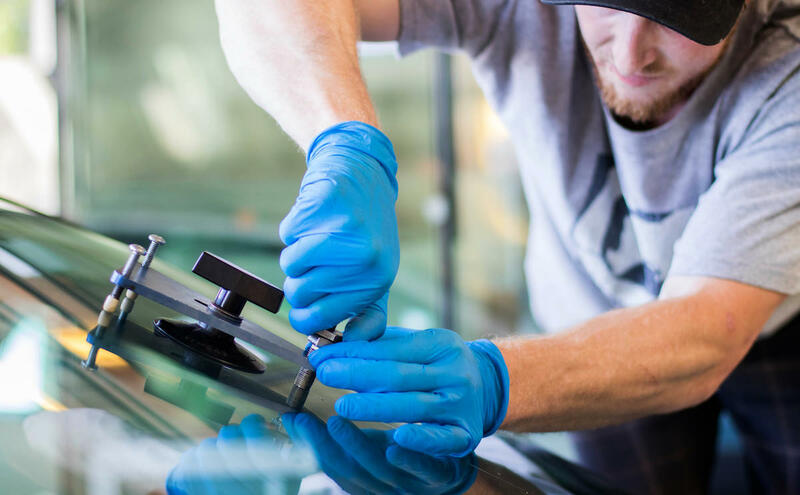 This process is used to make your windshield safer, but a small chip will seriously impact the overall strength of the windshield. Even minor windshield damage can cause the entire windshield to collapse when you hit a big pothole or a piece of flying debris hits the window. Unfortunately, waiting too long to repair a slightly damaged windshield could make it irreparable. If the chip or crack expands, the increased damage could render repair impossible, requiring a full replacement. Furthermore, driving with a chip or crack allows dirt, dust, and moisture to find its way into the damaged area. Even if the damage is able to be repaired, the debris that has lodged in the chip may cause the repair to appear permanently cloudy and discoloured. If left too long, this exposure to dirt and moisture could also require a full replacement. Small repairs never take more than an hour and are usually complete within 30 minutes. Attending to the damage promptly will mean that the repair will look better and be stronger. It is also more likely that your insurance will cover the repair if you act quickly, rather than letting the damage fester. Maintaining a safe distance from other vehicles will help you minimize the chance of a rock chipping your windshield, but it is impossible to completely avoid damage. Don’t let a small chip ruin your day – getting it fixed as soon as you can will save you money and result in a better repair. If your windshield is damaged, contact us today to start the repair process.